Conservative Leader Stephen Harper is promising to double the annual contribution cap for tax-free savings accounts to $10,000 after the budget is balanced. Conservative Leader Stephen Harper is promising to double the annual contribution cap for tax-free savings accounts after the budget is balanced. Harper made the announcement in Vaughan, Ont., where he is spending a second day campaigning in the vote-rich Greater Toronto Area. The Conservative government announced the tax-free savings accounts in 2008, which allows Canadians 18 and older to invest up to $5,000 annually. Harper said he would double that annual amount to $10,000 if he is re-elected. "The tax-free savings accounts have been a tremendous success. Just about five million Canadians now have a tax-free savings account … but we can all do more," Harper said. The changes wouldn't take effect until after the budget is balanced, which is expected around 2015, according to current projections. But Liberal Leader Michael Ignatieff scoffed at the timeline Harper set to introduce the measure. "I mean, what is this? A tax-free savings account in five years when rainwater is beer, when pigs fly," Ignatieff said at a Liberal campaign stop on Thursday. Currently, Canadians who do not save the maximum $5,000 each year can carry forward the balance forward to future tax years. It is estimated that more than 4.7 million Canadians have put money into these accounts, creating a market value of $17.9 billion. Harper said Canadians use the money put into the special accounts for various reasons, such as saving for home renovations or retirement. "This is another major step forward to allow Canadians to keep more of their hard-earned money and to save and invest in their own priorities," Harper said at a news conference. 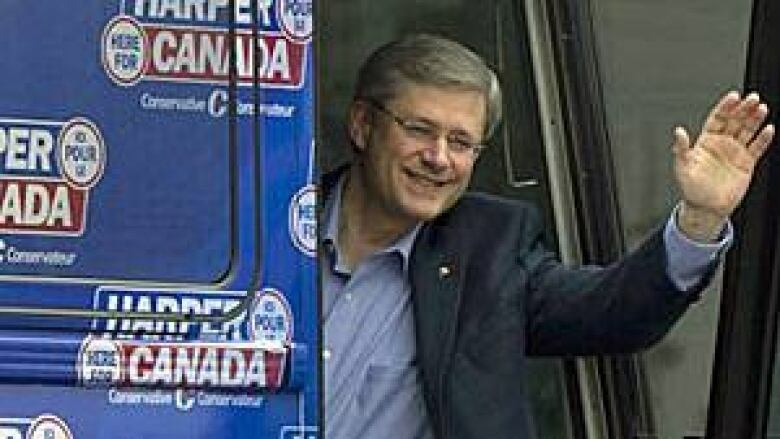 Conservative Leader Stephen Harper waves from his campaign bus in Richmond, Ont., Thursday. Harper said a re-elected Conservative government would increase the annual amount Canadians can pay into tax-free savings accounts to $10,000. (Sean Kilpatrick/Canadian Press)"Our low-tax plan has helped millions of Canadians save for the future and enhance their future financial security – but we need to continue to keep taxes down for everyone." The Conservatives are set to launch their full campaign platform during a campaign stop in Mississauga, Ont., on Friday. Earlier in the campaign, the Conservatives made another commitment that was post-dated until after the budget is balanced. Harper promised to allow parents with children under 18 years of age to split as much as $50,000 of their annual income, but the provision wouldn't come into effect until after the budget deficit is erased. As well, the Conservatives promised to boost the children's fitness tax credits to $1,000 from $500 and create a new fitness tax credit for adults, which would also be enacted after the country's budget returns to a surplus. The Conservatives also spent Wednesday in the Greater Toronto Area as the Tories hope to solidify ridings they won in 2008 and pick up new ridings in the key battleground region. Harper was to appear Thursday with Julian Fantino, the former Ontario Provincial Police commissioner, who won a byelection in November 2010 in the riding of Vaughan. The riding had traditionally been a Liberal stronghold. The Conservative leader also faced questions about whether he would cut the size of provincial transfer payments earmarked for health spending. The 10-year health accord, which was signed in 2004, must be renegotiated in 2013-14. Harper did not offer firm commitments on what a new health deal may look like. However, he again assured that provincial governments will not face cuts to their health transfers. Any future agreement would have "clear priorities," Harper said, and he would want to work with the other governments to ensure those priorities are achieved. "Our approach is to work with the provinces, not cut back on the provinces and not try to dictate to the provinces. We know there are some challenges and we want to work cooperatively with the provinces to make the system work better," Harper said. "But we are not about to throw the baby out with the bathwater." Harper also promised he'd abide by the separate health deal signed by Quebec in 2004. When the Harper government tabled its budget in March, Finance Minister Jim Flaherty had promised the Tories "will not cut transfer payments for crucial services like health care and education."